Camouflage: blackjack jargon for methods used by skilled players to conceal their true gambling actions. Examples are disguises and performing like average gamblers. Camouflage is used by card counters extensively when playing blackjack. Card Counting: strategy to allocate values to cards. Cards 2, 3, 4, 5 and 6=plus 1 and10, J, Q, K and Aces=minus 1 and 7, 8 and 9 are neutral at 0.As these cards are tracked during a session, a determination is made whether the remaining cards favor the player or dealer. Card Sharp: expert card player. Circle: area on the table layout where the player places a bet. Also betting circle or square. Clump: sequence of cards that favors either the house or player. Cold: blackjack game terms lingo referring to situation where winning cards have disappeared. Color: standard chip colors are $1=white. $5=red. $25=green. $100=black. $500=purple. Color up: exchange smaller denominations to larger denominations resulting in a smaller stack of chips. Count Down the Deck: memorizing cards already played to determine the remainder. Cover the bet: casino takes a bet to play. Also known as book the action. CSM: term for continuous shuffling machine. A machine that shuffles cards back into the deck(s) continuously rather than manually shuffling after deck(s) is finished. Disadvantage to card counters. Cut: after shuffling, the deck is separated into two parts by a player at the table and then passed back to the dealer. Cut Card: plastic colored card passed to the player to cut the deck. The dealer then places the cut card near the end of the shoe to indicate the last hand to be dealt. DAS: short form for double after splits. DD: short form for double deck game or double down. Deadwood: blackjack jargon for cards from previous play. Deal: cards given to players during the game. Dealer: casino employee who deals and manages the game of blackjack. Decisions: the game of blackjack consists of the following player decisions, hitting, doubling down, standing, splitting, insurance and/or surrendering. Deck: consists of 52 playing cards. When blackjack is played with more than one deck, the cards are called a pack. Deuces: blackjack game terms for the number 2 cards. Discards: cards played since the last shuffle and placed in a discard tray. DOA: short form lingo for double only any two cards, allows for doubling on any two cards. DAS: short form for double after split, allows for doubling down after splitting a pair. Double Deck: utilizing two decks in blackjack. Casinos may also use 4, 6 or 8 decks. Double down/Doubling down: doubling the bet before being dealt one additional card. Blackjack rules for doubling down are that the player receives only one card after a DD decision. Player may bet up to his/her original bet, but not more and places this second bet behind the original bet. Some casinos allow DD only with a count of 10 or 11. Draw: to receive additional card(s) to the 2 cards dealt originally. Also known as hit, draw card or hit card. Drop: total monies bet in a casino or total value of money and/or markers cashed in by players. Early Surrender: player loses 50% of bet if he/she decides to surrender after being dealt the first two cards. Even Money: refers to taking insurance on a blackjack hand when dealer shows an ace.Player is paid even money on his/her blackjack whether dealer has hit blackjack or not. Face Card: term for jacks, queens, and kings that have a value of 10 each in blackjack. Face Down: blackjack game where first card is dealt up and second card is face down. Face Up: blackjack game where both cards are dealt face up. First Base: blackjack lingo for player to the left of the dealer and the first person to receive cards. Also first baseman. 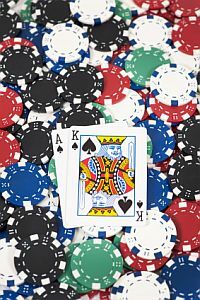 Five-card Charlie: blackjack jargon for 5-card blackjack that totals 21 or less. Rare but very sweet hand. Flat Bettor: player who wagers the same amount consistently. Front Loading: a peek at the dealer’s hole card that may determine strategy for the next hand. 1) What Blackjack Pairs should you NOT Split? A. 2’s, 3’s and 7’s. B. 4’s, 5’s and 10’s. 1) B. Never Split 4’s, 5’s and 10’s. Always Split 8’s and Aces when playing blackjack. Blackjack Game Terms is part 2 of 3 of the glossary.